For my second movie review on Oh to Be a Muse, I am going to review the movie "9" that is produced by Tim Burton. So, we went and saw "9" the other night. if you haven't heard of this movie yet, then Google it or something. it is produced (but not directed) by tim burton (of which i am a big fan). anyway, it's a movie about a world in which humans are nonexistent and only these puppet-like robots remain. it starts off quite dark and is filled with great visuals and a ton of action. it's pretty easy to see that this film is a product of a man who creates shorts with the intense amount of action compacted in under 90 minutes of movie. i actually felt like i would have preferred if the movie included ten extra minutes of story line/plot to counter all the machines, but overall, it was still a great movie. a lot of these tim burton-like movies (9, coraline, the nightmare...) aren't really meant for young children because they deal with more serious themes, like what happens when machines make decisions for you--a bit of 1984 and brave new world combined. 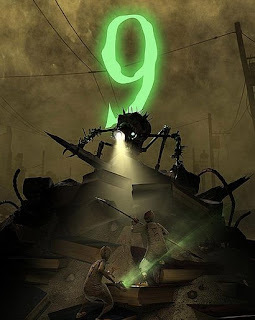 i would definitely recommend this movie, whether you're a fan of tim burton or not, because "9" has a lot of excellent elements that many current movies are lacking. and, of course, go see District 9 (for all you lame people who have yet to see it)--quite possibly the number one movie of the summer. Tonight at 9 we have the True Blood season finale. i watched all the episodes of the first season in less than a week, and i've had to watch this season the regular way--one episode at a time. i think it makes shows seem better when you don't have to wait a week to see the next episode, so with that, i'd say that i enjoyed season 1 more, but i'm still very excited for tonight's episode. i'd love to hear bill say "sookeh!" or see jason bring the heat, or just wait for the god who comes--for the god who comes, comes tonight. and to keep with my theme of the number 9, it took about 9 minutes for me to get my new tattoo yesterday. i'm very particular about things being permanent, so it took me almost a year in between tattoos before i was completely ready for this new one. i got it done by a girl, so that was cool because it made me more comfortable for some reason. 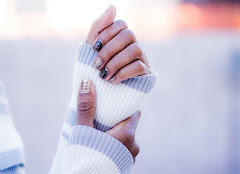 i also got to remember how painful it is--even when it takes no time. maybe one of these days i'll be able to get something big and artsy spanning my side, but probably not soon. next i think i'll get jack and sally on my legs...and if you don't know who they are, then you should learn more about me.